The words "Hyundai" and "luxury" became same-sentence partners with the Genesis, a roomy and well-equipped sedan whose price undercuts rivals by thousands of dollars. The Genesis coddles driver and passengers in comfort while offering a good mix of power and fuel economy. I was a die hard in the wool Lincoln town car fan, my last couple being a 2004 & 2010. Then they sent us searching elsewhere by discontinuing the town car. I was forced to shop elsewhere. It was my 13 year old son who introduced me to the genesis. 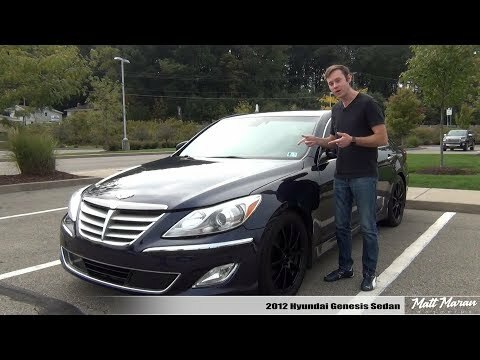 A single test drive in a 2012 genesis 4. 6 sedan and half way through I was asking if they had 2! My banker called it the corvette killer! I have actually had a Corvette, and that is a whole different world - let alone car. That is in no way a slight to my Genny! She is a beast, both a technology wizard, but with the old fashioned gumption to back it up! Exceptional luxury without the luxury price tag. If you want a luxury car and do not want to pay luxury prices, the genesis is the way to go. I have all the features I need and more. I am not fond of the gas mileage, but it is a v8 so I knew that going into the purchase. It handles very well and has the get up and go when needed. It is large enough to seat four adults quite comfortably. The trunk is huge! Overall, I am very happy with the car. I ABSOLUTELY LOVE MY GENESIS COUPE. iT IS COMPLETELY CUSTOMIZED BY ME. FROM THE CUSTOM EXHAUST SYSTEM TO THE WHEELS AND STEREO TO THE FULL RACE SUSPENSION. WHAT I LIKE MOST IS THAT I DID EVERY BIT OF WORK ON THE CAR MYSELF WITH NO ONES HELP. tHE ONLY COMPLAINT I HAVE IS THAT IT RIDES A LITTLE BIT ROUGH ON REGULAR STREETS.